Delicious, soft and juicy sausage stuffing balls made with sausage, apple, garlic and herbs. These bite sized beauties are perfect for any festive spread, be it Christmas, Thanksgiving or just because it’s the best time of the year! Serve with homemade cranberry sauce. 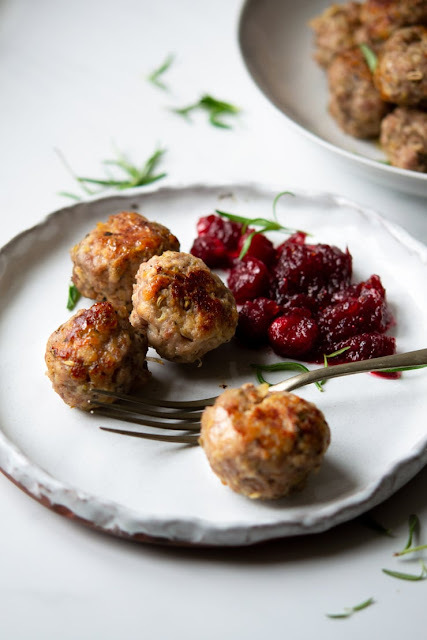 These sausage stuffing balls are not something you’d often find on an Italian table but they’re something I cannot forget about at this time of year! They’re super easy to make and let me tell you they are SO juicy, tender and delicious. Delicious, soft and juicy sausage stuffing balls made with sausage, apple, garlic and herbs. These bite sized beauties are perfect for any festive spread, be it Christmas, Thanksgiving or just because it's the best time of the year! Serve with homemade cranberry sauce. Preheat the oven to 350F/180°C. Grate the apple and onion using a box grater or shredding attachment on a food processor. Place all ingredients apart from the olive oil in a large mixing bowl. Using your hands mix all ingredients together until throughly combined. Shape the sausage stuffing mixture into meatballs using your hands (this makes around 16 balls). PLace in the fridge for 10 minutes. Put 1 tbsp of olive oil in a pan and brown the stuffing balls all over. Place the balls on a baking tray and cover with tin foil. Bake the balls for 25-30 minutes until cooked through and juicy. Use high quality sausages. This is very important and a crucial ingredient to get right, stick to 97%+ pork meat if possible with coarsely ground meat. Go for a sweet apple rather than a sour or tart variety. Use fresh homemade breadcrumbs, these with soak up a lot of moisture and keep the stuffing balls juicy. I use stale ciabatta for making breadcrumbs but you can use any crusty bread you have. Don't substitute for dry storebought breadcrumbs. No egg. Don't be tempted to add an egg to the mixture, there's no need for it as the sausage meat helps bing everything together. Season the mixture well with salt and pepper. If you are using Italian sausages then they may not need added salt. 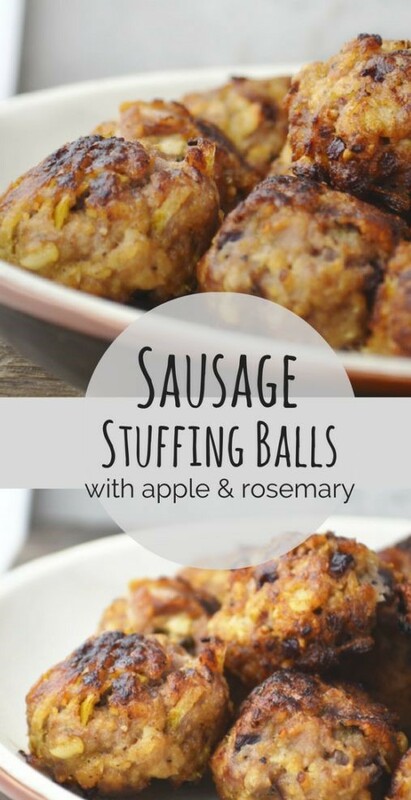 0 Response to "Sausage Stuffing Balls With Apple And Rosemarry"